Trade show and event marketing is a great way to expose your company, products or services to your prospective customers. Unfortunately, your competitor has the same idea and generally displays his products right alongside yours. How do you gain a competative edge , especially if you have a complex product or service and need to have your customer clearly understand how it works? The Cinemizer is the perfect tool to market your product at a trade show or event! 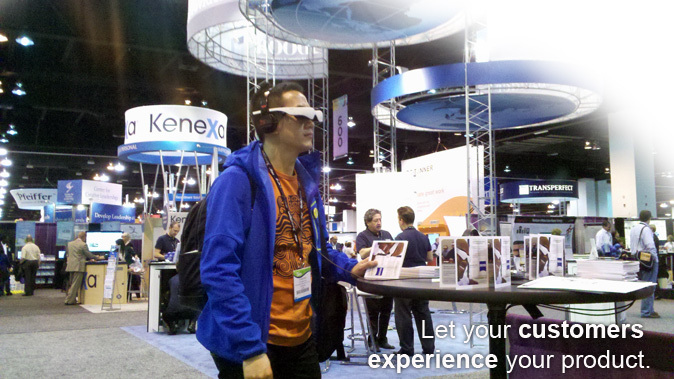 By having 8-10 Cinemizers connected together, a company can deliver a powerful message that will immerse attendees in their product or service commercial (in 3D) and create an environment where the attendee can focus his attention without the typical distractions at a trade show. plus get a first-hand experience of its features and benefits. 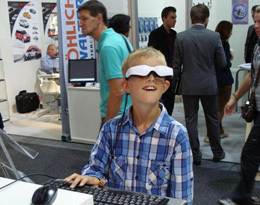 Total 3D Solutions can assist you with content as well as easy and convenient ways of using the Cinemizer at any trade show or event..
Do you have an idea where the Cinemizer could be used for a marketing application? Are you an advertising or marketing organization and would like more information on how the Cinemizer could be used to market a product or service? Are you a trade show manager and are ready to purchase a Cinemizer, accessories and content package?